Some great information here. Thanks! Do you know the procedure for changing the gear oil? Is it as simple as taking out a drain plug or is there more to do to clear the older gear oil completely? Once at a drip fit back the drain plug (washer can be reused if it's not oval).. Remove the 8mm's that hold the filter screen in place(on LH back lower section looks like a small flat plastic cap, thats the filter screen) ..once bolts are removed wiggle the screen out but do not pry, it will break, its just a o-ring keeping stuck up...clean screen with brake cleaner and refit..you can replace the seal is you wish, filter is always reused unless it's coming apart..
From the fill port, fill diff with gear oil(see beginning of topic for spec').. till fluid starts to drip out, fit back fill port bolt.. Fit back the undertray and your good to go!! what about redline 75-90 Limited slip version? Could if you want..on a manual shift box u might feel the thicker oil, on a ASM it can be ok if not driven in cold'ish weather (below +15C)..I know +15C isnt that cold, but it takes awhile for the transaxle fluid to heat up on a V8V..if the fluid was just for the diff like on a DB9, no problem, but on the V8V the axle fluid is the transmission fluid due to it being a "transaxle" configuration..
What about redline 75-90 gear oil and of course, the 75-90NS ("Non slip" for LSD transmission differentials)? actually, scratch the above. sounds like you might be able to use standard 75-90 in the gear box (not the NS type, as we have a separate set up for the LSD ) and we use a 130weight multi-vs in the rear end. what are opstions there? Anyone have any luck using Redline 75 /90 NS. (non slip)? bot it is then! thanks! 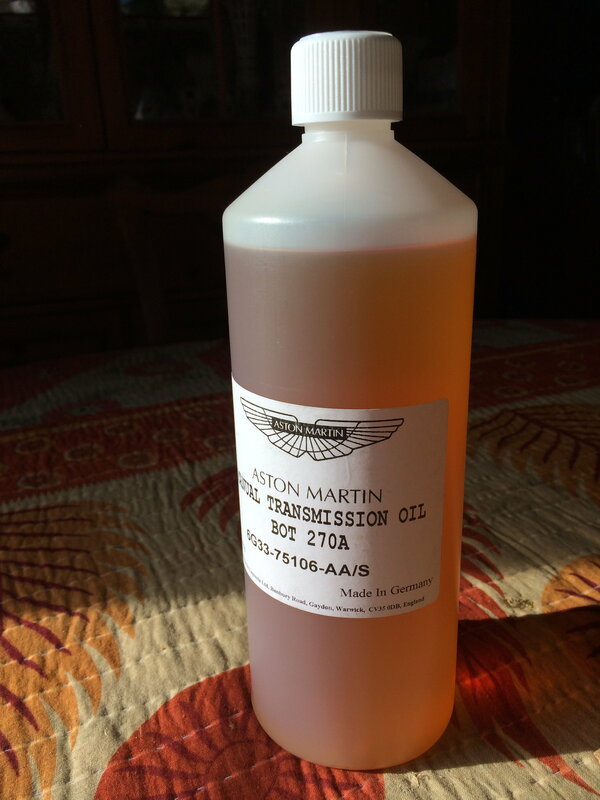 A US Aston Martin dealer has sold me transaxle fluid for my 6speed manual 2007 Vantage. The discussion and pictures in this sticky says BOT 270A is best for our application and is delivered in molded white plastic Castrol containers. The fluid supplied by this dealer, however, says it is BOT 270A, but it is not in a Castrol bottle. It is in a taller, cylindrical, white opaque plastic 1 Litre bottle with an applied paper label. Maybe this is an attempt at private branding? Irish, know anything about this stuff? I am trying to reduce/minimize, stiff/hard first to second gear shifts. Will this dealer's proposal do the job? The discussion and pictures in this sticky says BOT 270A is best for our application and is delivered in green Castrol containers. The bottle is usually white and 1L, with a Castrol label. Although it's the correct part number. The bottle could of changed, Aston did this awhile back with the DB9 ZF fluid..that's the same bottle style Aston used for there version of the ZF fluid..just different color fluid in your bottle along with a different label(usual print of label from Aston though). I have yet to see that bottle, so I imagine it's Aston HQ in UK reducing costs by ordering in Vrac and packaging with there own facility versus using Castrol to bottle and label. We still have a few cases in stock of the white bottles, I'd imagine come spring I might start seeing that new bottle.. I'm doing the gearbox and differential fluid changes (ignoring the sealed for life claim) and just had a thought, "what if there's already SPIRAX AST in there?". How could I tell, furthermore what are the consequences of such a mixture? [QUOTE=flinder;4434542]A US Aston Martin dealer has sold me transaxle fluid for my 6speed manual 2007 Vantage. After having service bulletin 0236 done I posted the following on my website at bernardembdeen.com. I waited until the next morning, when the car was cold to test the first to second gear shift. It was flawless, the gearbox behaved exactly as if it was fully warmed up. A few weeks went by, and in late November, one night the temperature in west central Florida (Tampa area) dropped overnight to approx. 40 degrees. The next day, the gearbox refused to go into second gear after exiting my driveway. After a few minutes of driving it became slightly better, and after it reached operating temperatures it was fine. It appears that Service Bulletin 0236 might very well be a fix for warm temperatures only. When cold (below 40 degrees) my car exhibited the same reluctance to shift into second gear as it did prior to Service Bulletin 0236. Any car currently having this first to second shift problem is probably out of warranty. That said, my advice for anyone having this problem is to have it done. While not a complete cure, it does improve the shifting (at least in Florida) enough to warrant the expense. If money is an issue (and it always is) then skip the bell crank lever upgrade. You will save some money and I believe the effect should be minimal at best.